We have written many articles for unlocking Huawei Modem through various types of software. In some unlocking software was involved, in some unlocking dashboard was involved, but today for unlocking Idea NetSetter Huawei E162G there is no any software or dashboard is required. You just need to change a file in your computer and you have done it. 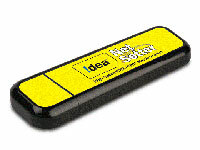 Its an easy process to unlock your idea netsetter E162G usb modem without using any thirs party software. then replace DeviceInfo.xml file with your edited Deviceinfo.xml file wow now your idea netsetter is unlocked Enjoy.